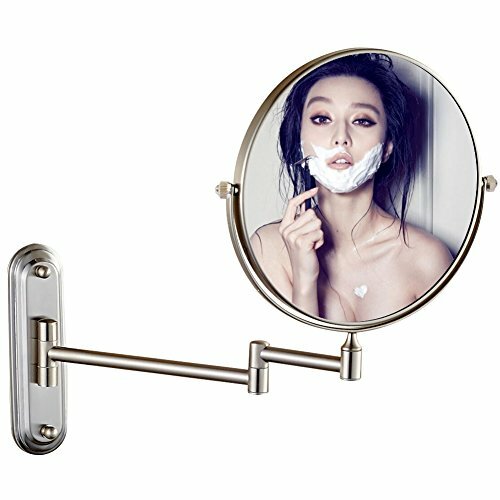 WHY YOU CHOOSE THIS TYPE WALL MOUNT MIRROR? 1. Features a smooth 360-degree swivel design and can be adjusted to any angle you like. 3. Mirror diameter is 8 inch, perfect size for most bathroom. 5. Mirror is made of high quality glass and brass material, 5 year warranty for NO-RUST. 6. All metal construction with polished nickel brush surface. 1. Magnified side is only for close up makeup or shaving, so the distance between you and the mirror must be within 2''. Too far will cause vertigo, it is a normal physical phenomenon. 1x and 10x magnification options to make sure every detail of your hair and makeup are in place. Made of high quality brass,Nickel Brush finished.Used in luxury hotels and spas. Has a glare-free, shadow-free, and crystal clear view for multiple purposes, such as make-ups, back viewing, shaving, tweezing, putting in contact lens, etc. Comes with hardware for easy mounting on almost any surface, such as bathroom wall. It is recommended that the distance with 10x mirrors ideally not exceeding 2 inch to get true image. If you have any questions about this product by GURUN, contact us by completing and submitting the form below. If you are looking for a specif part number, please include it with your message.